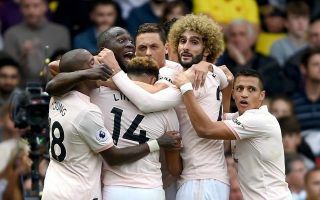 Manchester United striker Romelu Lukaku is showing himself to have serious captaincy credentials with his extra work in training. According to the Metro, the Belgium international is taking half an hour at the end of each training session to help youngster Marcus Rashford develop his finishing. The report states that the pair are working on attacking drills together, in what Jose Mourinho and the club’s fans will no doubt hope can help Rashford improve his game. The England international burst onto the scene in the 2015/16 season but has arguably seen his career stall in recent times. Lukaku is a big part of that in some way, with the former Everton man the undisputed first choice for the centre-forward position, forcing Rashford wide. Still, it would be nice if Lukaku could in some way help the 20-year-old one day replace him by passing on that wisdom to him after a great career as a striker in the Premier League.